Our practice has a specialist endodontic microscope to aid with diagnosis and treatment, meaning our success rates are more than 95%. We also use the latest rotary files and apex locators, working to the highest standards. 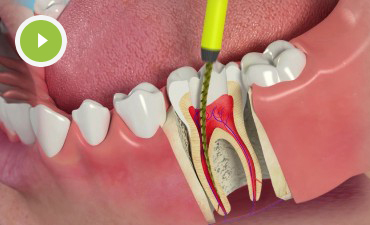 The root canal of the tooth runs from the crown all the way to the root and contains the dental pulp. Infection is fairly common and can be caused by tooth decay, cracks in the teeth or injury. While front teeth have one root canal, back teeth have several, meaning treatment can be complex. This is why we are exceptionally proud of our 95% success rate. Many patients are nervous when they hear the words “root canal treatment”, but the procedure will be painless as it is carried out under local anaesthetic with our dentist who is trained and qualified with a Masters degree in endodontics at a world leading dental hospital. Depending on the complexity of the root canal system and the treatment needed, you may need one or two visits to the practice for root canal treatment to be complete. If you require more than one appointment, a temporary crown or filling will be fitted to your tooth between appointments. It is usually recommended to strengthen a root canal treated tooth with a permanent crown once treatment is complete.